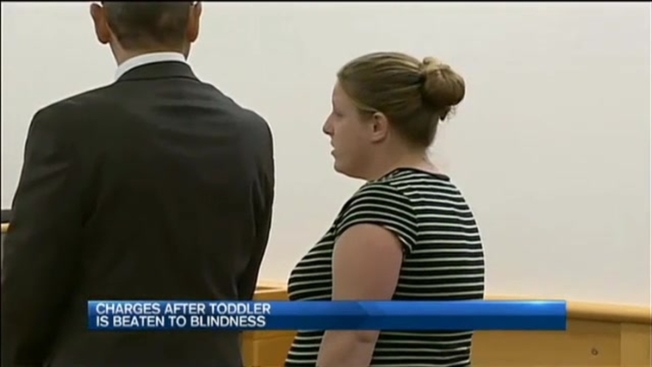 A New Hampshire toddler was beaten to blindness, and now that child's mother is talking about the guilt she feels for leaving her son with the person who allegedly abused him. Little JoJo will be 2 in September. His mom, Lindsey Dubon-Romero, tells necn he is legally blind, but otherwise healthy. She was in court Thursday to come face-to-face with the woman who allegedly abused JoJo over the course of several weeks. "That's all I really want to know, is what happened to my child, because he don't deserve it," Romero said outside Rockingham County Court. "He's a baby." Romero provided necn with the heartbreaking photos of JoJo at Boston Children's Hospital in a medically induced coma. Prosecutors say Epping resident Jami Castine abused him. Castine didn't want to talk to necn outside court, but inside, gruesome details were revealed. According to police, on April 8, Castine hit JoJo in the head so many times that she caused bruising, brain bleeds and permanent visual impairment. "Right now, he is learning to walk with a walking stick because he is legally blind," Romero said. Romero says she was struggling with homelessness back in March when she sent her two sons to live with Castine, who she met through a mutual friend. "I kind of took her word for it, and I shouldn't have," she said. Castine's mother, Joni, is also charged for failing to report signs of abuse. Her father, Tim, is facing a felony charge for allegedly deleting a cell phone video of the beating. Castine's parents told necn off camera they had nothing to do with JoJo's injuries. Meanwhile, Romero is being charged with neglect, but she argues her intentions were good. "I don't feel like I neglected him, I was trying to do what's best so they weren't on the streets," she said. "Don't trust nobody with your children." Castine also allegedly sold drugs while JoJo was in her care. She and her parents are out on bail and are due back in court at a later date.